2 February 2015: have started up a page about Healthcare Improvement Scotland (HIS). From a critical viewpoint. Listing blog posts already written which mention HIS and writing new pieces. The main impetus for highlighting their work is because of increasing concerns that senior management in HIS think themselves to be above scrutiny and not accountable to the public whom they (are meant to) serve. I sent a letter yesterday to the OPAC (older people in acute care) improvement team and their parent leads Healthcare Improvement Scotland, raising concerns about their stable of videos which promoted the Think Delirium posters and the 4AT concept, still being evaluated. On the page "OPAC tools are working". I felt that, although the films looked positive and had good production values, they were lopsided in terms of no voices to be heard from older people/patients or carers. There was a feeling of reinforcing stigma in the promotional materials and that dementia was linked to delirium and frailty, by virtue of a person being confused and elderly. Here is some artwork done in Paint by me to demonstrate what I wouldn't want to be happening with my image were I to be incapacitated or dead. Note the copyrighting just in case there is any confusion. I sent these off to the OPAC and HIS folk. So I Emailed the National Clinical Lead Karen Goudie at Healthcare Improvement Scotland, copied in to various HIS senior managers plus my MSP Roderick Campbell, to find out why I was getting "special treatment". I am writing to you about the @opachis twitter account as it seems I am blocked from seeing the tweets via my @ChrysMuirhead account. See screenshot attached. "Official page for improving care for older people in acute care workstream, led by Healthcare Improvement Scotland." I am wondering why I would be blocked from seeing tweets on an "official" NHS Scotland account. Is there a reason for this? I received a response from Penny Bond on 11 February by iPhone, which said "At the moment we don't know how this happened, as there are a number of staff who have access to the account some of whom are on leave at the moment." It's now 13 February 2015 and I still don't know why I (@ChrysMuirhead) was blocked from the OPAC "official" twitter account. On 30 January 2015 I received a letter via Email from Robbie Pearson, Deputy Chief Executive, Director of Scrutiny & Assurance, Healthcare Improvement Scotland (HIS), to say that the complaint I raised, on 5 December 2014, against Karen Goudie, HIS National Clinical Lead, in respect of her social media exchanges with Dr Peter Gordon, had been upheld. "We are reviewing our social media guidance to strengthen understanding, and to ensure that it is consistently complied with across the organisation. This is the story (or process) of my campaign, in respect of the complaint to Healthcare Improvement Scotland, which began on 5 December 2014 when I came upon a twitter conversation between Ms Goudie and my friend Dr Gordon. This led to my raising a complaint by Email and sending it to the HIS leadership on 5 December at 21.25, copied in to Ms Goudie. Who made a reply at 23.04 that same night, mentioning "police Scotland" and including evidence she had gathered which had my name on it. I opened the Email from Ms Goudie the following morning, 6 December, and replied at 08.05, maintaining my complaint. I was unhappy with what I perceived to be a defensive attack, trying to further discredit Dr Gordon and me, by association. There followed further correspondence with Christine Hill, HIS Complaints Officer, in response to my request for a copy of the HIS social networking policy, receiving the information on 10 December. On 18 December I wrote to ask for confirmation that my complaint was being considered and eventually on 6 January I was informed by Ms Hill that Robbie Pearson, Director of Scrutiny & Assurance, would be looking into it. I received the complaint response letter from Mr Pearson on 30 January, replying on 3 February 2015 with my thoughts about his decision. On 5 December 2014 I noticed on Twitter that my friend and colleague Dr Peter Gordon was being harassed by Karen Goudie, National Clinical Lead, Healthcare Improvement Scotland who was tweeting in her "professional" role. I use the word "harass" because of the language used. I have known Dr Gordon for nearly two years and engage with him regularly by Email. We have met in person on a few occasions, most recently when we both were spectators in Scottish Parliament at the Mental Health debate on 6 January 2015. We engage as allies and equals. I don't know Ms Goudie personally or professionally although I did know she was a national lead with HIS and have copied her, along with many other leads, into Sunshine Act for Scotland tweets. For their information. I understand that she did work for NHS Forth Valley and now works for NHS Fife. Because it was on her twitter account. I was concerned by the tone and the words used by Ms Goudie in these tweets. The implication being conveyed in the message. I thought it was both a personal and professional attack on the character, behaviour and reputation of Dr Gordon. I immediately sent a few tweets in warning to Ms Goudie, saying I would be making a complaint. Strapline: "complaint about Karen Goudie using twitter to harass and bully fellow professionals"
I am writing to complain about the HIS National Clinical Lead, Ms Karen Goudie, and her unprofessional use of Twitter to harass and bully Dr Peter Gordon, Consultant Psychiatrist. Dr Gordon is a friend and colleague of mine. I am very unhappy to see him victimised in this way. In social networking circles this is called "trolling" and should be unacceptable behaviour for a person who has set up their Twitter account in a professional capacity. I contend that this type of behaviour is bringing the NHS Scotland organisation Healthcare Improvement Scotland into disrepute. See attached tweets made by Ms Goudie to Dr Gordon and his response, in a screenshot, and also my three tweets sent just now when I found out what was going on. I would like a copy of the Healthcare Improvement Scotland social networking policy which sets out the standards and expected behaviour of your staff on social media. I look forward to hearing from you. I am copying in Dr Denise Coia and Dr Brian Robson, for their information, also Ms Goudie. The Email response by Karen Goudie, HIS, was sent on 5 December at 23.04, received by me the next morning. It may be helpful to include below. I have blocked Peter from my account a long time ago and reported the past interactions to Twitter, so I don't see his tweets, colleagues were concerned about the below so I asked that he stop. I feel very uncomfortable with this behaviour and the retweeting of my photo today and have reported to police Scotland." Strapline: "my complaint still stands - Scotland is a free country, a democracy, and we are entitled to have a voice and to be critical"
I am not sure why you have sent me these screenshots or mentioned "police Scotland" in an Email to me. I know about the Ayrshire Health blog post as you personally responded to a comment I made on the 'Flying without wings' post, mentioning your uncle whose photo was used on one of the images Think Frailty/Think Delirium. I had been critical of these images and said that I wouldn't want my face to have these words scrawled across it publicly. I am still of the same mind, even after your comment, and said that I would be informing my relatives not to do the same with my photo were I ever to get dementia and be "without capacity". I am entitled to my opinion. Regarding the "retweeting" of your "photo" yesterday I know nothing about this. Your photo is on your twitter account, similarly my photo is on my twitter account, on my blogs and websites. I've never met you but I would know what you look like because of your photo being now on the internet. Similarly people would know what I look like, and I am recognised when I attend mental health events, by people who have never met me before, even in London when I took part in a seminar in March and May this year. I am not sure about your comment "colleagues were concerned about the below". If you have blocked Dr Gordon from twitter then I don't know why you are engaging with him on twitter. If I block anyone from twitter then I have nothing more to do with them, ignore them, don't see their tweets, don't engage with them. End of. They may mention me but I won't see it because they are blocked. Regarding the comment by Dr Gordon on the Ayrshire Health which was addressed to me, here it is attached for everyone to see. I appreciated the response from Peter Gordon as I appreciate the conversations we have on a regular, sometimes daily, basis. We are friends and colleagues, and I consider it a privilege to be his friend. He is a questioning psychiatrist and I am a critical voice in mental health, an unpaid carer and psychiatric survivor. I appreciate that we are as equals in conversations. Dear Ms Foster my complaint still stands and I would like it to be investigated. I am not happy to see my friend and colleague Dr Peter Gordon singled out for "special treatment" because he speaks out his concerns about the treatment of delirium, the pushing out of the A4T and is a questioning voice. Dr Gordon is a professional, an experienced doctor and a caring man. He is entitled to his opinions and to challenge what he sees as concerning developments in the treatment of elderly people. I am 62 and soon will be one of the "elderly". I also have concerns about the way that older people are being treated in hospitals and psychiatric settings. Seeing the label and not the person. Seeing the delirium and not the person. There are no quick fixes to working out why a person is "confused". Tools and TIME bundles are not the whole answer and may be a hindrance in the hands of people who are not seeing the whole person first. I want to add that I do not respond to bullying tactics or to threats of intimidation. I have been excluded by Healthcare Improvement Scotland from attending Scottish Patient Safety events and I am not happy about it. I am entitled to speak out about human rights abuses in psychiatric settings which have happened to my family or to others. Dr Peter Gordon is entitled to speak out his concerns about the treatment of elderly people with confusion. He is an expert in this area and well qualified to speak out. Scotland is a free country, a democracy, and we are entitled to have a voice and to be critical. If we all agreed with everything then it would be a totalitarian state. We need critical voices to bring balance. This lots blind enthusiasm concerns me a lot. To compare delirium to a medical emergency like a “heart attack” is not right in my opinion. The mortality with delirium is mostly due to underlying conditions. It is also the case that delirium involves you as a person (sentience) which is not the case with the heart. And delirium is not the same as a stroke as delirium is a state (I am not even sure it is a syndrome) rather than specific pathology. There have been huge problems, unresolved, in defining delirium. This is no doubt for good reason! We are not even close to having any characteristic medical tests (‘biomarkers’ if you like). It is clear that delirium affects attention and that is why months of the year backwards are used to test for attention in the 4AT. However it is another matter to take wholesale decisions on such a test alone. Yesterday I see Dr Copeland posted a tweet saying she was “proud” to have detected 7 cases of delirium and then put them on Adults with Incapacity legislation to protect them. Lynn is not correct in what she says about dementia. The 4AT is used to try and “detect” this also with the virtually useless four questions of the AMT4 incorporated into it. This has not been validated. To me it is a bit like trying to assess a drunk person for psychosis or mania! Not a good idea! HIS: "engaging in social media requires resource – a commonly held view that it is simple and easy to do is misleading"
Recently I had to take the step of making a complaint about a senior manager in Healthcare Improvement Scotland (HIS) who I noticed was using Twitter inappropriately. To harass another healthcare professional who had different opinions and a questioning voice. I am very sensitive to this type of coercive behaviour, having been subjected to it myself on occasion by people in high positions who think that they are entitled to patronise, bully and exclude me because I speak out from an opposite viewpoint or with a critical voice. When making my complaint to the HIS Chief Executive I asked for a copy of their Social Media Policy. However I was informed that they "do not hold a formal policy on employee use of social media". Rather the HIS staff are guided by" their "code of conduct policy" and a "Social Media Guidance" document. "Holders of public office are accountable for their decisions and actions to the public and must submit themselves to whatever scrutiny is appropriate to their office." "Everyone is responsible for their own actions and behaviours and must take steps to ensure they conduct themselves appropriately at all times." "By the nature of Healthcare Improvement Scotland work, staff come into contact with many people and organisations from outwith the organisation. It is important that, at all times, staff treat all people with courtesy and respect, and without bias or prejudice." Make comments which could negatively affect the reputation of the organisation, employees, patients, stakeholders or partners. Post content that could be viewed as unlawful, libellous, harassing, defamatory, abusive, obscene, sexually-oriented or racially offensive or of a bullying nature. Harassment, threats, intimidation, ethnic slurs, personal insults, obscenity, racial or religious intolerance and any other form of behaviour prohibited in the workplace is also prohibited on social media channels. Use social media channels for internal business communications between fellow employees. It is fine for employees to disagree, but never use your external blog or other online social media channels to air your differences publicly." • Employees who engage about topics relevant to our work should always be aware that their disclosures are not private or temporary. Social media disclosures live online indefinitely, and employees should remember that they will be visible to a broad audience and possible even read out of context. A good maxim is when in doubt, leave it out. • Once initiated, conversations on social media cannot be controlled and you may hear/see things you don’t like; it is OK to have a variety of views expressed which conflict with your own. • Social media is immediate – be aware that the types of conversation that happen in social media channels require a degree of immediacy that challenges organisational culture and the way organisations have traditionally worked. So engaging in social media requires resource – a commonly held view that it is simple and easy to do is misleading." I believe it is the responsibility of the very senior managers at Healthcare Improvement Scotland to ensure that their employees are abiding by the Code of Conduct and behaving appropriately on Social Media. Guidance not followed is like a chocolate teapot, in my opinion." This is a reminder to say that, although I received an Email with the HIS Code of Conduct Policy and the Social Media Guidance, I have had no acknowledgement of my complaint about Karen Goudie's use of Twitter made on 5 December 2014. I have read through these documents and wrote a blog post highlighting the points which stood out for me, regarding appropriate behaviour for Healthcare Improvement Scotland staff. Thank you for your letter dated 29 January 2015 which upholds my complaint against Ms Goudie and in which an apology is offered, on behalf of Healthcare Improvement Scotland. "Ms Goudie said that she had done so because the exchanges had become difficult for her and that he (Dr Peter Gordon) was sending his blog to all the individuals she connected with on social media." 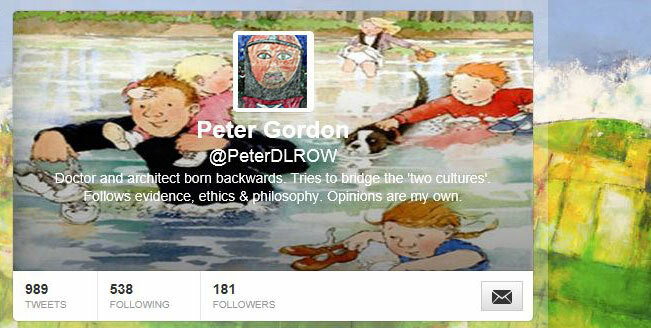 "You commented that Ms Goudie had used Twitter to harass and bully Dr Gordon. Ms Goudie has been categorical in her explanation to me that her intention was not to seek to bully or harass Dr Gordon but rather she had sought, after a series of increasingly difficult messages, to bring the exchanges to an end by the request to ‘please stop’. I am prepared to accept this explanation." Firstly I want to say that the world doesn't revolve around Ms Goudie. And neither does Twitter. You may accept an HIS employee's defence that her intentions were not harassing or bullying in nature. However intentions are very difficult to prove. Actions and outcomes are more evidence based, in terms of a person's intentions or behaviour. Ms Goudie had blocked Dr Gordon on Twitter. Therefore she had no reason to check up on his tweets. Her colleagues may have been relaying to Ms Goudie what was in Dr Gordon's tweets but that is no reason for her to react to their prodding and target Dr Gordon. That, in my opinion, is harassment. Because her twitter account was in the name of her role with HIS, a national manager position. I have just checked her twitter account at present, see attached screenshot, and I note that Ms Goudie is still tweeting in her role as National Clinical Lead, HIS. I also note that she is now working in my neck of the woods, "improving care for older people" in Fife, where I have lived for 25 years. Now that concerns me, being 63 this year. I am not confident of Ms Goudie's ability to behave professionally. I have seen no evidence of it. These are my thoughts for now about your letter. I will reflect more on what you have written and respond again. I have written this story of the complaints process entered into with Healthcare Improvement Scotland as a record of my campaign and to demonstrate the effort involved in trying to obtain any sort of justice. For what was, in my opinion, a character assassination attempt. Because of a questioning voice. In full view of the social networking world and the public. I was aware of the pressure that Dr Gordon had been under in his former consultant psychiatrist post at NHS Forth Valley, from Brian Robson, Executive Clinical Director, HIS. The same health board area that Karen Goudie worked in until recently when she appears to have moved to NHS Fife, according to her twitter account. Glassborow, Director of Safety Improvement, and the subsequent slandering of my character and reputation by a senior civil servant, Geoff Huggins, because I complained about being left out of celebrations at Edinburgh Castle in the summer of 2014. Why was I excluded? I believe it was because of the human rights abuse, the "unreasonable treatment" perpetrated on my son in Stratheden Hospital, Fife. They didn't want me speaking out about the abuse at their party and so I was silenced. Left out in the cold. No critical voices allowed. Yet I had first raised concerns about Lomond Ward, Stratheden, in 2010 with Geoff Huggins, then Head of the Mental Health Division, Scottish Government, by Email. I subsequently met Mr Huggins face-to-face at St Andrews House, Edinburgh, 14 January 2011, Room 3E.02, at 10.30am, and with Basil Haddad, Mental Health Improvement Lead, also present. I told Mr Huggins in 2010 about the risks to female patients in Lomond Ward, the inappropriate behaviour of male nurses, how I witnessed a Russian female Masters student from St Andrews in a state of undress and so could other male patients walking past. There was no dignity for women in the ward. Nothing was done. Then in 2012 I saw more of the same and worse. Male patients in the female dormitory and no nurses around to supervise. Female patients under observation free to roam around the ward, into the male dormitory at night, unsupervised and vulnerable. At risk of sexual exploitation. A female patient, a 57 year old grandmother, discharged from Lomond Ward, Stratheden Hospital, 31 March 2012, took her own life 4 days later, her body washed up on a beach in Northumbria two weeks after. I spoke to this woman that March after I witnessed a male patient, former prisoner, walk down the corridor and into the end female dorm where she had a bed, no nurses around, a woman shouted out. I made a complaint at the time. I can name these patients. I am not prepared to be silenced by senior civil servants who are not doing their jobs right, in respect of patient safety and the meaningful involvement of people with "lived experience". They are public servants and have a responsibility to the public. They are not above reproach and therefore should not be getting away with bullying and excluding those of us who speak out with questioning and critical voices. It's a matter of free speech, justice and accountability. "I have been asked by a few friends why I decided to leave Social Media. For sometime I had a twitter account @PeterDLROW but I closed this account on the last day of 2014. There are several reasons why I have decided to leave social media behind however the primary one is that as an NHS employee in Scotland I do not feel safe in using social media. The personal consequences for me in raising ethical considerations on twitter to try and help improve care for our most elderly have been most significant. The organisation that appears to have struggled most with my ethical questioning has been Healthcare Improvement Scotland. There are individuals who have not shared my views who have associations with Healthcare Improvement Scotland and may have contributed to this response. I miss twitter for sharing with others my many interests which include film-making, the arts, architecture, medical humanities and most things outdoors." I thought the Scottish Medicines Consortium event would be useful for me to attend, particularly since I have been supporting the work of Dr Peter Gordon in his Sunshine Act for Scotland Petition that has been going through Scottish Parliament. Therefore I ticked on the link to the Eventbrite registration process and booked a place at the SMC conference. Put the date in my diary and was looking forward to hearing about the "SMC appraisal process for new drugs"
Thank you for your interest in our upcoming event on 24 March. This event is aimed solely at voluntary sector organisations which are either registered charities or voluntary organisations which are constituted and therefore eligible to make a Patient Group submission to SMC. The main purpose of the event is to provide information and support which will help patient groups who are submitting to SMC. All attendees at the event have be there as representatives from a charity or voluntary organisation due to the aim of the event and the limited places we have available. I noted from the details that you have put down on the sign up form that you have not put down a specific charity or voluntary organisation that you are there to represent. Therefore, if you are attending to represent a voluntary organisation could you please give me the details of the organisation and your role/job title, so that I can amend this on the form. If you are not there to represent a specific organisation, then unfortunately I will need to cancel your place at the event. If you have any questions about any of this, please get in touch." I did get in touch, over a few Emails, saying I was an Alliance member, had run a voluntary sector organisation Peer Support Fife but had to stop due to caring duties and funding stopping. I did ask if I was the only person being moderated in this way. It felt discriminatory. I explained that it had said on the SMC website that the event was for "those who have never taken part but are interested in the SMC appraisal process for new medicines". That was me. I copied in both Ian Welsh, CEO, and Irene Oldfather, Director, of the Alliance, to the Emails. However it appears that my name has been deleted from the database of delegates. Excluded yet again by another Healthcare Improvement Scotland Officer. From a key event where my questioning voice could have been captured, and brought a bit of balance and insight, from the carer and psychiatric survivor perspective. Guidance not followed is like a chocolate teapot, in my opinion.